As you know at Swim Smooth we take a very individual approach to swim coaching, tailoring our advice for your specific needs as a swimmer. Here's a great example of why we do that. The first thing that will strike you is that they are very different heights and builds. Byron's 5' 0" (1.52m) tall and weighs just 44kg. Brad is 6'2" and literally twice Byron's weight! Despite this difference in height and build they both swim at very similar speeds (CSS pace around 1:06 per 100m!) and together they form an exclusive pairing at the very front of our fastest lane in the squad. Both swim at an extremely high level, Brad setting the fourth fastest time ever for the 19.7km Rottnest Channel swim back in February and also holds the world record for the 25km Port-To-Pub. 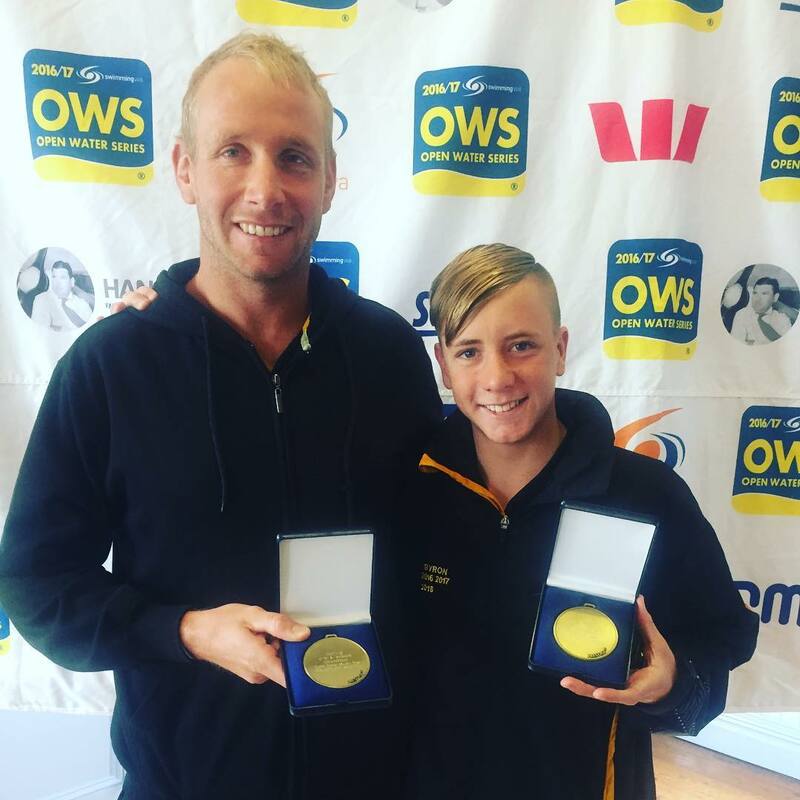 We are very privileged to have a swimmer of Brad's calibre in the Swim Smooth Perth squad. As you can see he's got a classically long and powerful stroke, very similar in style to open water swimming greats such as Oussama Mellouli and Ferry Weertman, winners of the last two Olympic 10km marathon swims. Note his stroke is long but still has plenty of rhythm - an essential ingredient to swimming well in any open water conditions, let alone those as rough as this. Byron's absolutely killing it, swimming super effectively and powering through the rolling swells at nearly 100 strokes per minute (SPM)! Byron recently finished 3rd in the Australian National Champs and at the tender age of 16, he is only going to get better. 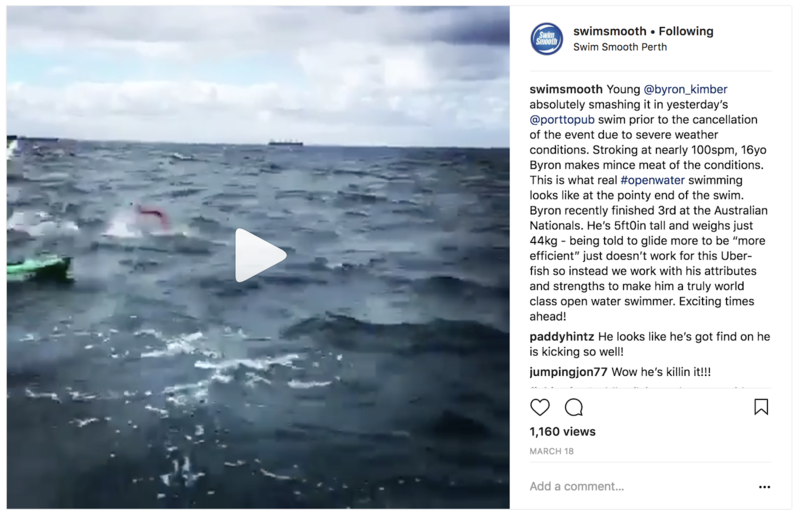 Being told to glide more "to be more efficient" just doesn’t work for this super-fish so instead we work with his attributes and strengths to make him a truly world class open water swimmer. Exciting times for both these amazing swimmers ahead! - Firstly, we have two swimmers both operating at a very high level but with COMPLETELY different stroke styles. This proves beyond a shadow of a doubt that this is no single best way for everyone to swim. You need a stroke style that suits you height, build, fitness, flexibility and goals, and that could be completely different from your best friend, or the fastest swimmer in your club that you admire. This idea is at the very heart of Swim Smooth coaching. - Secondly, if you are not the tallest person in the world you might have been thinking that your height is holding you back. Byron shows us this need not be the case! You will never have as long a stroke as someone much taller than you but you can still have a very effective stroke: a great technique combined with a faster turnover is the key here. Depending on your level of ability you might not hit 100 SPM like Byron but it could well be developing things progressively into the 65-80SPM range is right for you. We're not asking you to fight the water - quite the opposite - you can do this working with the water to move you effectively and powerfully forwards - just like Byron.